The 3 Sprouts Organic Hanging Wall Organizer will help get your playroom organized in no time flat. Kids will love to store books and other small items in this hanging solution – making clean-up time at least a bit more fun. Each organizer is easy to hang and comes with three generous pockets, which will work perfectly for diapers, coloring books, art projects and supplies and much more. 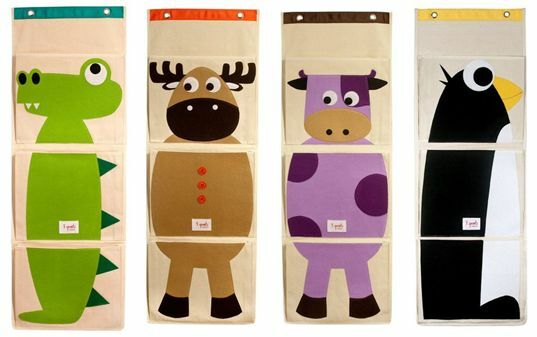 The 40″ x 14″ organizers are made with 100% organic cotton canvas and 100% eco-spun felt (made from recycled plastic bottles), and they come in four fun animal styles. adorable! I would use these myself! The 3 Sprouts Organic Hanging Wall Organizer will help get your playroom organized in no time flat. Kids will love to store books and other small items in this hanging solution - making clean-up time at least a bit more fun. Each organizer is easy to hang and comes with three generous pockets, which will work perfectly for diapers, coloring books, art projects and supplies and much more. The 40" x 14" organizers are made with 100% organic cotton canvas and 100% eco-spun felt (made from recycled plastic bottles), and they come in four fun animal styles.